Grease stains (i.e. butter, gravy, salad dressing, etc.) can be set by a hot water wash and drying – Often you can pretreat certain items with grease-fighting detergent, but some items should be professionally treated and cleaned. Red wine stains must be neutralized for complete removal. Follow the fabric care label. In most cases you can blot or flush with water. Chlorine bleach may appear to remove the stain, but could damage the fabric. Coffee with milk and sugar is a combination stain that if left untreated will oxidize and become permanent. Follow the fabric care instructions and don’t neglect these stains. Never delay bringing your holiday table linens to Anton’s for complete stain removal, cleaning and pressing. A professional cleaning will ensure your holiday table settings look great for years to come. And most importantly, if you or your guests drip, dribble, or drop, the best DIY stain treatment is to blot it out, NEVER rub. 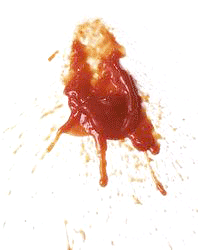 What is the best thing to do when ketchup spills on clothing? Some things just seem to go together, such as summer and ketchup. But spills are inevitable. Most importantly, act quickly. Remove any excess ketchup with a spoon or knife, but be careful not to rub it into the fabric. Avoid dabbing at it as this can spread the stain. If the garment is washable, remove the garment as soon as possible and run cold water through the stain from the backside to force the stain out of the clothing. Then, gently rub liquid detergent into the stain and soak the garment in cool water for at least 10 minutes. Wash and air dry. Heat from the dryer can set the stain and make it very difficult to get out. 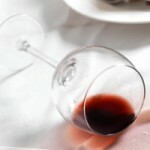 If the ketchup stain is still there, apply stain remover stick, gel, or spray and launder according to directions. If the garment requires drycleaning, bring it as quickly as possible to the drycleaner and point out the stain. The longer you wait, the harder it will be to remove the stain. A. It’s important to protect your clothing from stains as well as perspiration and suntan lotion harm this summer. Perspiration shows up particularly in underarms, collar, back and waistbands of garments. It may not be noticeable at first, but oxidizes over time, becomes darker and stains clothing. Garments should be washed or dry cleaned regularly so the perspiration residue is removed when fresh, preventing permanent damage. Sunscreen and sun tanning lotions contain ingredients that can cause stains. It is best to apply the lotion and let it dry before dressing and to wash your hands thoroughly before touching your clothes. When cleaning your clothes, follow the care instructions carefully. When washing, pre-treat the stain with a prewash product, then launder in the hottest water that’s safe for the fabric or have it dry cleaned. Remember to point out and identify the stain to your drycleaner. Spills seem inevitable in the summertime – outdoor parties, barbecues and light color clothing can spell disaster. If the stain is water-based, such as soda, coffee, juices, wine and most fruits and the item is washable, blot the stain and then use an instant stain remover, such as Tide-to-Go. As soon as possible, wash the item according to care instructions. Remember that sugar-based stains such as those from fruits should be washed within 24 hours to prevent yellowing. For oily stains, such as salad dressing, cooking oil, meat juice, butter, and lipstick, the best approach is to blot the stain with a dry, clean white cloth. Do not use water and do not rub the stain as this can set it and break the surface fibers. Oily stains are most safely removed by dry cleaning when the stains are fresh; so do not delay in having the garment cleaned. Be sure to identify the stain to the drycleaner. If you do not know the nature of the stain, it is safest to assume that the stain is oil-based. A. The first thing to do is determine if it is a water-based stain or an oily stain. Water-based stains include soda, coffee, juices, wine and most fruits. If the item is washable and it is an emergency spill, blot the stain and you can use an instant stain remover, such as Tide-to-Go. As soon as possible, wash the item according to care instructions. Remember that sugar-based stains such as those from fruits should be washed within 24 hours to prevent yellowing. For oily stains, such as salad dressing, cooking oil, meat juice, butter, and lipstick, the best approach is to blot the stain with a dry, clean white cloth. Do not use water and do not rub the stain as this can set the stain and break the surface fibers. Oily stains are most safely removed by dry cleaning when the stains are fresh; so do not delay in having the garment cleaned. Be sure to identify the stain to the CSR. Some stains are a combination of water and oil and it is best to begin treatment as an oil-based stain. If you do not know the nature of the stain, it is safest to assume that the stain is oil-based. A. Chocolate fountains and fondues are great fun on Valentine’s Day. While chocolate stains can be difficult because they contain both greasy and non-greasy substances, in most cases they can be removed. Begin by gently scraping the chocolate with the back of the butter knife and remove as much as possible. Then review the clothing care instructions. Bring to the drycleaner, if the instructions say to dry clean, and point out the stain. If the tablecloth is washable, blot with a mild detergent and rinse with water. You may have to repeat this process. When soaking gently rub the stain to get the chocolate out. Sometimes after you have removed the chocolate, an oily stain remains. Apply a stain removal spray (after checking for colorfastness) and wash according to the care instructions. Remember to check the stain before putting the tablecloth in the dryer so you do not set the stain. A. Although industry experience shows that on average shirts have a two-year life expectancy, the number of launderings is a better indicator of the life of a shirt. The average shirt should have a wear life of 35 to 50 washings. Of course, this will vary depending upon the fiber content, the type of fabric and the severity of stains and perspirations and overall strain put on the shirt when wearing. If left untreated, spills can quickly weaken cotton fabrics and shorten the life of a shirt. A. While sunscreen is essential to protect your skin from the sun’s harmful ultraviolet rays, there are ingredients in sunscreen and sun tanning lotions that can cause stains. Most of these products contain oil to make them moisture resistant and therefore it’s important to be careful how they interact with your clothing. Initially the stains may be invisible but the heat of cleaning can cause them to show up. It is best to apply the lotion and let it dry before dressing and to wash your hands thoroughly before touching your clothes. When cleaning your clothes, follow the care instructions carefully. When washing, pre-treat the stain with a pre-wash product, then launder in the hottest water that’s safe for the fabric or have the dry cleaned. Remember to point out and identify the stain to the drycleaner. A. While it’s possible to try removing the nail polish at home it can be problematic depending on the type of fabric. While nail polish remover does a good job getting rid of polish on fingernails, it may create another stain. Don’t despair. Pack your little girl and her dress in the car and take it to your dry cleaner as soon as possible. Because little girls often get into nail polish, our cleaners are experienced at doing a good job getting out dried nail polish! And there’s always a bright side to such catastrophes. We know one mother who cut out the portion of the dress with the spilled nail polish and had it framed as a memento of the occasion. A. This is a common remedy, but you need to be cautious. While hairspray and water can remove ballpoint ink, there is alcohol and oils in hairspray that can cause color damage. This can result in irreversible damage on silks and other fabrics as well. A. If the garment can be washed, soaking and agitating in cold water before washing can remove fresh protein stains. If protein stains are dried or old, scrape or brush off crusted matter (if any), then soak in cold water using a detergent or an enzyme presoak product. After treating the stain, launder in warm (not hot) water, rinse, and inspect. If stain remains, soak an additional half-hour, and then rewash. In some cases, due to the natural or artificial coloring in ice cream, the use of mild bleaching agents may be necessary to remove the last traces of stain. A. The most frequent cause of this type of streaking is hair care products. This may be the problem with your blouses since they appear only on the backs. It’s only a guess but I’ll bet you have long hair. The streaks can also be yellowish in color. Check your shirts and blouses carefully, you may find streaks on the shoulders and neckline as well. This occurs because hair care products often contain oxidizing agents. If you take these garments to a cleaner, let it be known what hair care products you use so that the area can be treated as a stain. However, there’s nothing that can be done to eliminate the discoloration once it has occurred. A. There are still a few cleaners who will try to re-dye a garment. However, there are many issues that can affect how successful this will be, such as the garment itself, the particular stains, and finish. Before trying to dye a garment, you should know that a darker color will usually not cover up color loss. Dyes cannot recognize that more color is needed in one area than another, and the result could be a garment with uneven color. Now, here’s a big issue: different fabrics require the use of different types of dyes. Using the wrong dye will produce uneven color. The original color plays a role, too. In many cases, dyeing can be less than satisfactory. A. Dyes on buttons can bleed during cleaning or pressing, leaving discoloration on the fabric. Some button dyes are soluble in dry cleaning solvents. In other cases, the problem can arise in steam pressing. This can occur because the manufacturer has labeled the garment fabric dry cleanable, but did not take into account the buttons. If you find buttons have left stains, we suggest that the buttons be removed so we can attempt to remove the stains. Then replace the original buttons with more serviceable ones. A. It’s difficult to know the cause of the problem without seeing the garment. Surprisingly, there are certain every day household substances that can cause spots of color loss. These include everything from perfumes, colognes, skin fresheners, aftershave, hair spray, lotions, medicines, and alcoholic beverages to home bleaches, perspiration, cleaning products, toothpaste, detergents, fruit juices, and salt water. Sometimes the loss of color does not appear until after the garment has been cleaned. Now, what should you do? Never put a garment away if it has a spot! Never iron a stain; the heat sets it––permanently. Bring us the garment as soon as possible and give us as much information as possible about the cause of the stain. A. Is it possible that juice or some other beverage was spilled on the sweater? When the stain occurs, a paper towel is often used to absorb as much of the juice as possible. And the stain disappears to the eye. If the garment is not taken to a professional drycleaner immediately, the unseen stain “sets” and appears at the end of the cleaning process. Good advice: even if you can’t see the stain, take the garment for dry cleaning as quickly as possible. Be sure to tell the cleaner about the stain. A. More often than not, this problem is caused by a liquid being spilled on the garment. It could be juice, a soft drink, beer, wine or other liquid. When there’s a spill, most people take a napkin or paper towel and blot the spill. In many cases, the spill seems to disappear and we forget about it. Unfortunately, the residue remains and eventually oxidizes and turns yellow or brownish. Since the residue is mostly water soluble, it isn’t removed during dry cleaning and can become more pronounced in the drying process. There’s good news, however: this does not need to happen. Make a mental note of the location of the stain so you can point it out to your cleaner, and if the fabric allows, mark the spot with a safety pin. By making this extra effort, you’ll be pleased with the results. A. There are several possible explanations. First, there may have been what we call “hidden” stains on the blouse before you took it to the cleaner. Perhaps sugars, liquids, oils or perspiration had contacted your blouse. Such stains only become visible in high heat, such as that used in the dry cleaning process. Second, the stain may have been caused by a breakdown in the fluorescent whitening agents that are often applied when the garment is manufactured. Sometimes these agents break down during dry cleaning, leaving yellowish traces on a garment. If this is the situation, it is the responsibility of the garment’s manufacturer to replace it. If at all possible, flush the garment with water and get it cleaned as soon as possible after an “invisible” stain occurs. A. Such natural fibers as cotton, linen, and silk can be damaged by high iron temperatures, resulting in fabric yellowing or browning. In addition, there is possible strength loss to the fabric, depending on the ironing temperature and the length of time the iron was in contact with the fiber. Polyester, acrylic, nylon, and acetate synthetic fibers can melt when the ironing temperature goes above 250º F. Unfortunately, fused synthetic fibers cannot be restored. To remove scorch marks from natural fibers, hand wash the item with a mild detergent. More severe scorching may be corrected by soaking the garment in a bath of six to eight ounces of 3% hydrogen peroxide (available at your local drugstore) and mixed with a gallon of water. As oxidizing bleach, hydrogen peroxide can cause color loss. So, apply to a seam or unexposed area, and let dry. If the color isn’t affected, soaking the garment in a bath should be safe. For severe scorching, the garment may need to be soaked for several hours. Hydrogen peroxide loses its strength after an hour, so the bath will need to be replenished. Take garments that can be dry-cleaned to your cleaner. The garment may be able to be restored, depending on the extent of the damage. A. It happened because no one checked your dress after removing a spot. At Anton’s, garments are checked by the spotter, drycleaner and presser. A final quality control check takes place as each garment is bagged. The problem should have been seen and corrected. A. Many people aren’t aware that prolonged contact with deodorants and antiperspirants may cause permanent damage to clothing. More often than not, it’s the overuse of these products or infrequent cleaning that produces the worst damage. They build up and create a stiff and caked residue. As we get into spring and summer, this can become something of a problem. Frankly, it’s best to wash or dry clean garments (depending on the manufacturer’s care label instructions) after each wearing to keep them fresh and avoid possible damage from deodorants and antiperspirants. A. Since there are so many types of stains and fabrics, stain removal is often a complex procedure, particularly when the type of stain is unknown. It takes years of experience and continuous training to become a skilled “spotter.” At Anton’s our cleaners are constantly learning new techniques and procedures for effective stain removal. A. Although chewing gum can be removed from many garments simply by dry cleaning, it is always best to point out the spot for proper pretreatment. If the item is machine washable, dry cleaning may not be the best option. In these cases, chewing gum can often be removed by blotting it with an ice cube. This hardens the gum and makes it stiff and brittle for easy removal. If any gum remains, sponge it with a solvent-based spot remover. Test the fabric first to make sure the color is not affected. A. Once school starts, there is always a flurry of “paint problem” questions. Fortunately, most paints children play with are water-soluble and come out with regular washing. But there are other paints, acrylics, for example, that are better left to professional cleaners who are experienced in flushing out the stain removal chemicals once the spot has been removed. A. Crayon stains are caused when the heat from drying melts the crayon material and can usually be removed by a drycleaner through dry cleaning and stain removal procedures. Be sure to point out the stain and explain what happened to your drycleaner. A. There are ingredients in sunscreen and sun tanning lotions that can cause stains. Most of these products contain oil to make them moisture resistant. It is best to apply the lotion and let it dry before dressing and to wash your hands thoroughly before touching your clothes. Read the care instructions carefully. When washing, pre-treat the stain with a prewash product, then launder in the hottest water that’s safe for the fabric or have the suit dry cleaned. Remember to point out the stain to the drycleaner. A. For years, club soda was considered the “cure” for all spills. In reality, while it may appear to be helping, it breaks down the fibers and causes color loss. It usually just spreads out the stain, making removal more difficult and sometimes impossible. The safest approach is to blot the stain with a clean, white cloth and have it dry cleaned as quickly as possible. Be sure to point out the stain and let the drycleaner know what caused it.